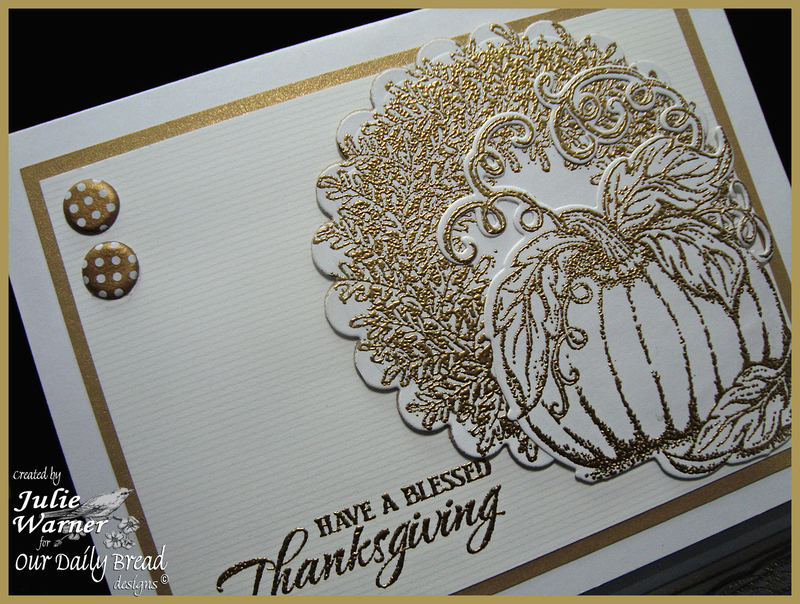 Congrats again to Marcie, the Featured Stamper this week on Splitcoast (FS298)! This time I chose her Tree Trimming Christmas to case. I kept the Christmas tree theme, colors and big circle but changed the layout, put my tree inside my circle to make a snow globe and added some trimmings w/ the die cut holly and cut out pine cones. The images are from Our Daily Bread designs. I really wanted a big snow globe card and when I saw Marcie’s Christmas tree card, I thought I’d try putting my tree inside the globe. The music bg was stamped w/ the sand ink and I used deckle scissors to cut it out. I die cut the snow globe out of white and again out of metallic gold. I used 2 circle dies to cut out the gold rim for my globe (I needed a way to hold the acetate down). On the white one, I stamped the tree and presents, masked them then using a stamp positioner, I stamped the music so it would line up w/ the bg…as if you’re really seeing thru the glass globe. The the greeting was added and instead of worrying w/ loose glitter, I just smeared stickles on the tree and presents. After it dried, I added the acetate and gold rim and attached it to my card. The die cut holly and cut out pine cones were added for trimmings. The finished card is 4.25 x 5.50. 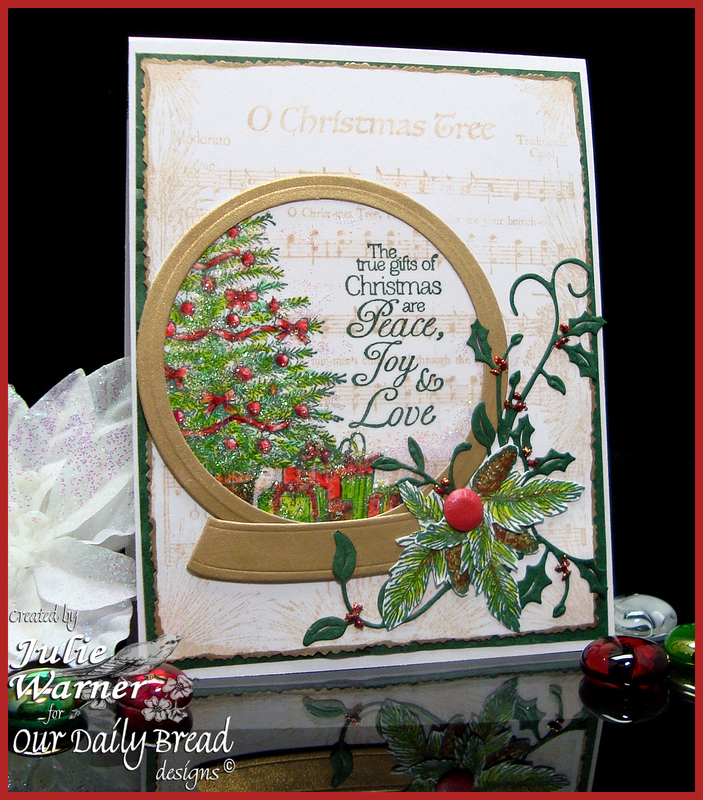 Congrats to Marcie, the Featured Stamper this week on Splitcoast (FS298)! I chose her Figure Skates Surprise to case. I kept it CAS like Marcie’s card and the general layout, but I flipped it and my circle became a wreath. Instead of designer paper, I gold embossed everything and added my paper as a second layer. Instead of Christmas, I made mine a Thanksgiving card. The images are all from Our Daily Bread designs. 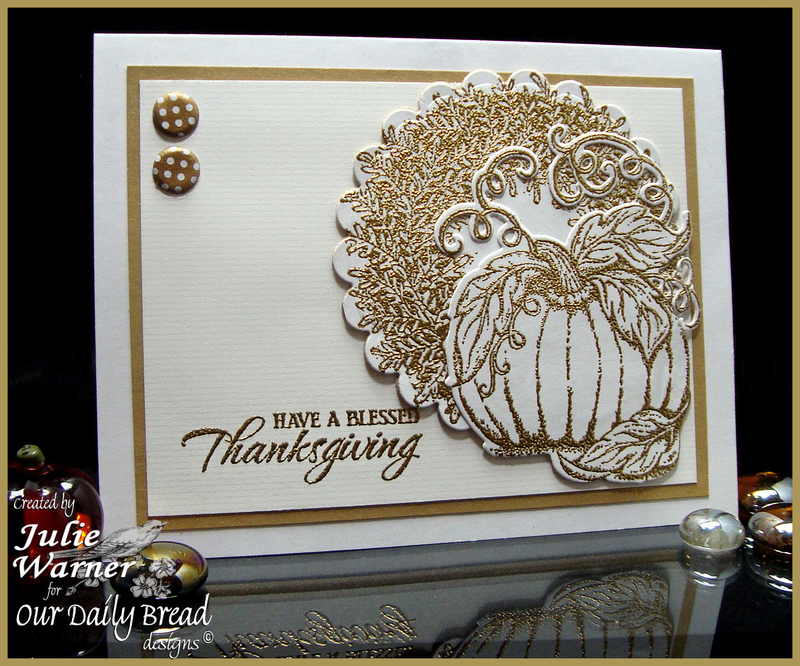 After gold embossing the wreath and the pumpkin, I used a scallop circle die to cut the wreath and the ODBD matching pumpkin die for the big pumpkin. The sentiment was also gold embossed on a piece of white card stock that has a faint gold stripe on it. I added a metallic gold layer and two gold Candi buttons. The finished card is 5.50 x 4.25. Fun challenges on Splitcoast today! I made this for the Technique Lover’s Challenge (TLC399), and also for the Clean and Simple Challenge (CAS192). I had a lot of fun with the TLC challenge. Super technique! I used the memtento inks on the block and also to stamp the various images. I did another square block and stamped the leaf image then die cut it w/ the deckled rectangle but I resized it fit around the image. The greeting and wheat stalk were stamped w/ the sienna ink. 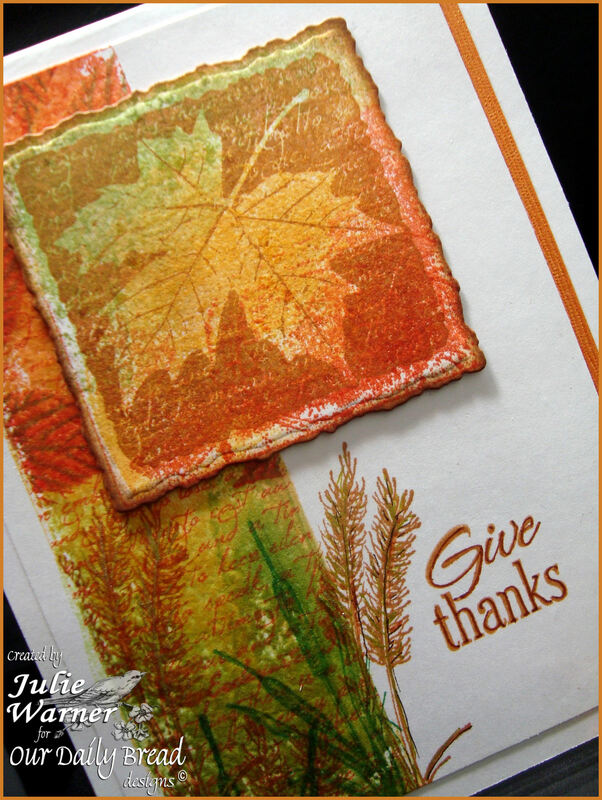 I overstamped some of the leaves and wheat stalks using the gold ink. The images are all from Our Daily Bread designs. I had this narrow little copper strip left over and thought it looked good, so I added it down the right side. The finished card is 4.25 x 5.50.